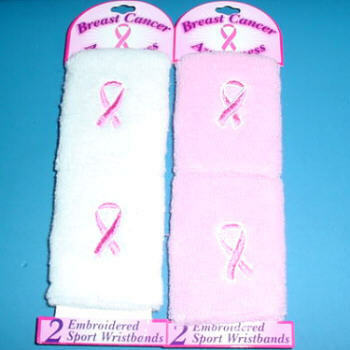 Pink Ribbon Sweat Bands, come in pairs (2) wristbands per pack.You will either receive the white sweat bands or the pink sweat bands with your order. Color choices are Pink or White. Choose color from drop down menu when ordering. When ordering 36, you will get 18 pink and 18 white. If you need 36 of the same color, please choose the color you need. These sweat bands are great for football teams, soccer teams, softball teams, tennis teams and volleyball teams. A great way to raise awareness for breast cancer in October and all year long. I have hundreds in stock. Order some for your team today!